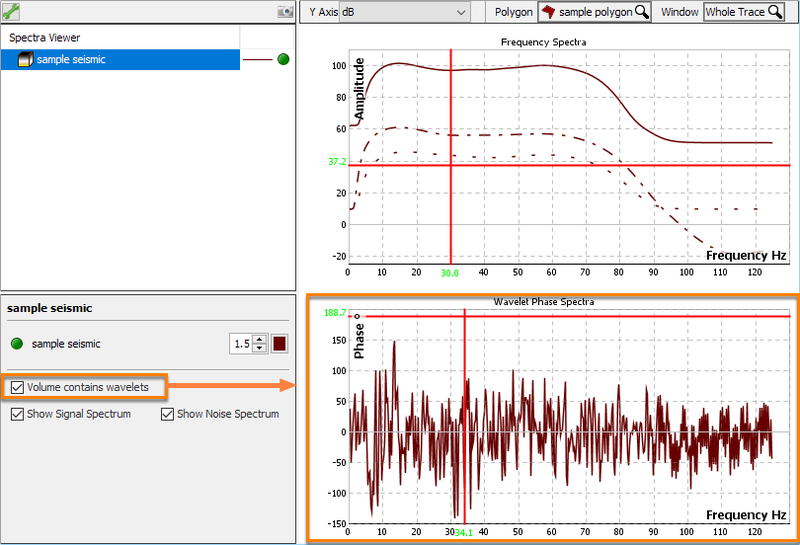 Use Insight’s Spectra Analysis to view and compare the spectra of volumes and wavelets. Results can include signal and noise spectra as well as time, frequency and phase plots for wavelets. Note: Spectra Analysis does not operate on depth volumes. Convert depth volumes to time using Time/Depth Conversion before analysis. 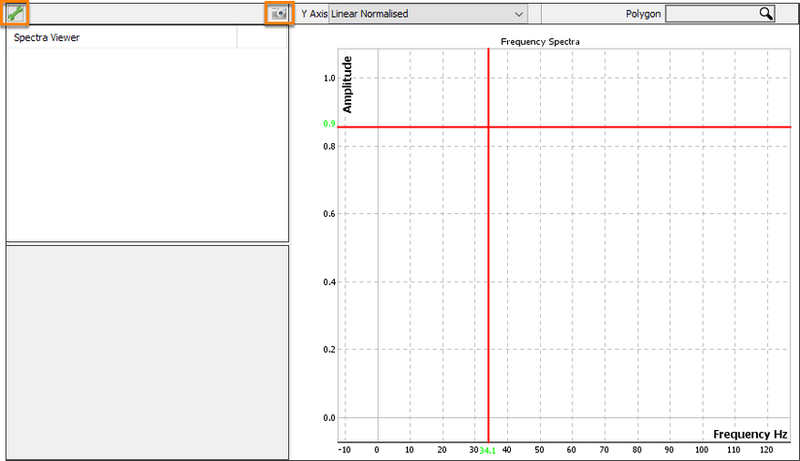 In Control Panel, go to Tool > Spectra Analysis to open the Spectra Analysis view. To add data to the Spectra Analysis window, see Adding Data Sets. 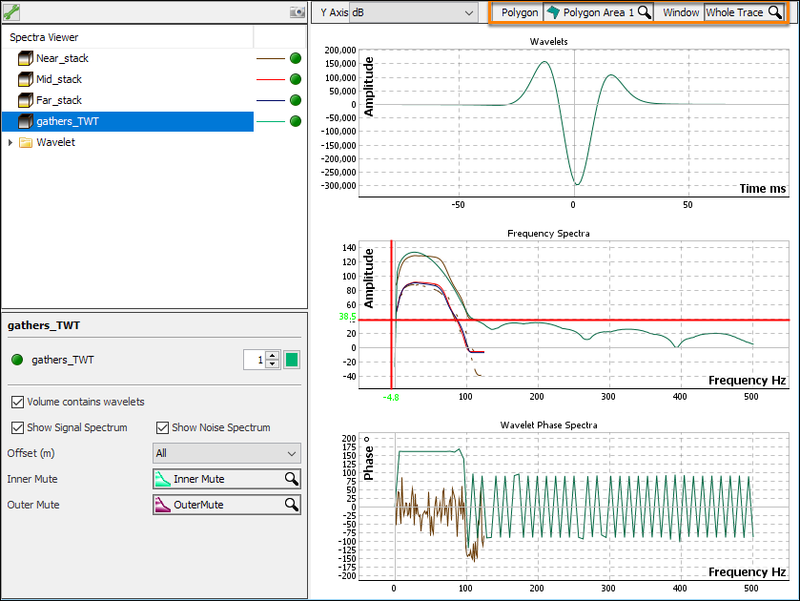 Spectral analysis supports wavelets, 2D, 3D and gather volumes. Additional settings are required when analysing gathers (see Adding Gather Volume). Add volumes and wavelets to the view by dragging them from the Control Panel, or right-clicking and choosing “Send to Spectra Analyser”. Select an entry in the left panel to show its settings. Camera icon: Take a screen capture (see Taking Screen Captures). Frequency spectra are plotted in the right panel. The data to analyse is defined in the toolbar by selecting a polygon. If a map polygon is chosen, optionally specify the window (vertical interval) by choosing a layer from a window model (see Defining a spectral analysis window, Creating a Polygon, Creating a Windowing Model). If a wavelet is selected, additional amplitude and phase plots are included. These can be disabled if not required. Additional configuration settings are available by clicking the tool icon (see Defining Spectra View Settings). To display Signal and Noise spectra, see Signal and Noise Estimates. Zoom and pan work in a similar manner to other views. Rubber-band zoom: Hold down the right mouse button and drag in the plot to zoom into the selected area. Pan the area: Hold down the left mouse button and drag in the plot to pan the plot in the direction of the mouse. Scroll zoom: Scroll the mouse wheel up to zoom in or down to zoom out. When zooming in, it will focus on the location of the mouse pointer. Zoom to fit: Right-click and select Zoom to fit to fit all the plots in the window. Wavelet panels: To hide or show the wavelet amplitude and phase panels, right-click on the display area and choose Hide/Show wavelet panels. For polygons created in section views (IL/CL, 2D, Arbline, etc.) the samples inside the polygon are used. For polygons created in the Map View, analysis is performed on the whole trace or the specified layer of a windowing model. Tip: To hide the Wavelet Amplitude and Wavelet Phase charts, right-click a plot and click Hide wavelet panels. Note: Configure the axis type of the display by right clicking anywhere in the plot and selecting Configure Track.